Timer works simultaneously with thermometer to constantly monitor inner temperature! 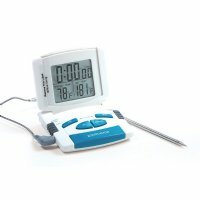 Monitor inner meat temperature from the convenience of your counter, stovetop or oven door using the magnets on back! Ideal for ovens, stoves, BBQ and deep fryers! Stainless steel cord and probe. Instant digital readout, pre-settable alarm and magnet on back. Automatic alarm sounds when inner temperature is reached with a stainless steel 9"/23cm probe. Complete instructions, temperature guide and AAA battery included. Temperature Range, 140Â°F-395Â°F / 60Â°C-200Â°C. Hand wash probe and use a damp cloth to wipe down unit.